This is my final preliminary sketch for my next painting. It is on 18×24″ paper, but the painting will be 20×26. I designed the scales on him which means it may not be exactly like a real one would look. I also didn’t take time to shade in the shell. 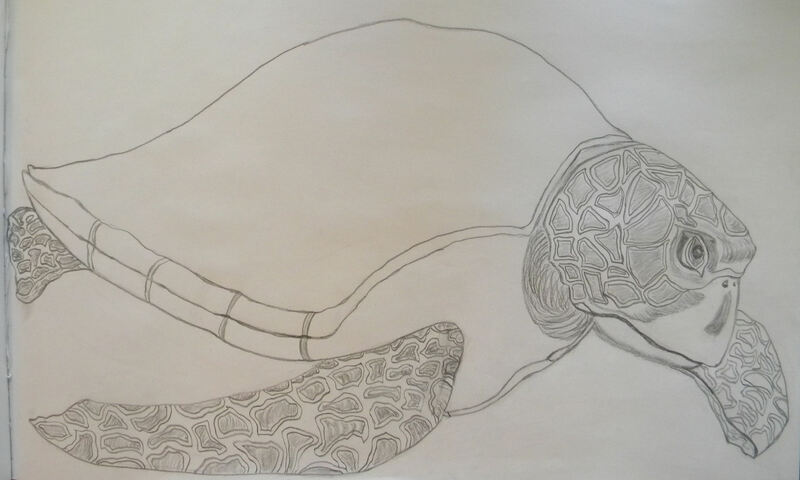 Next I need to get it transferred to my watercolor paper and begin my next painting in my sea turtle series. Posted on August 11, 2014, in Sea turtles. Bookmark the permalink. 2 Comments. Thank you, Jill. I am beginning to think I’m going to have to make drawing them part of my life’s work. I saw an article in “Drawing” magazine about an artist named Jimmy Wright who has been drawing and painting sunflowers in many different ways for many years. Pretty interesting.